As we close this series on Strategic Growth, the question arises, how does one determine a company's inherent growth rate? While the answer "it depends" is accurate, it's not terribly useful. To get a useful answer, let's ask the question "what typically constrains company growth?" The model stems from the premise that the supply of funds must equal or exceed the demand. Demand for funds is caused by growth (SSGR). 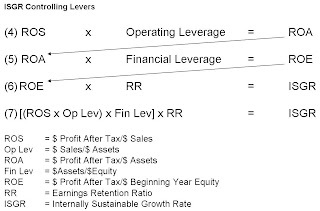 Dissecting equation (3), the sources of funds are retained earnings, invested assets, debt, and new equity. All figures are calculated as percentages. The main limitations of the model are that the ratio of sales to assets (or investments) is relatively stable over the planning horizon. This means that the model degrades if there is a large build up in capital assets (causes the model to overestimate SSGR), high inflation, or time horizons over five years. 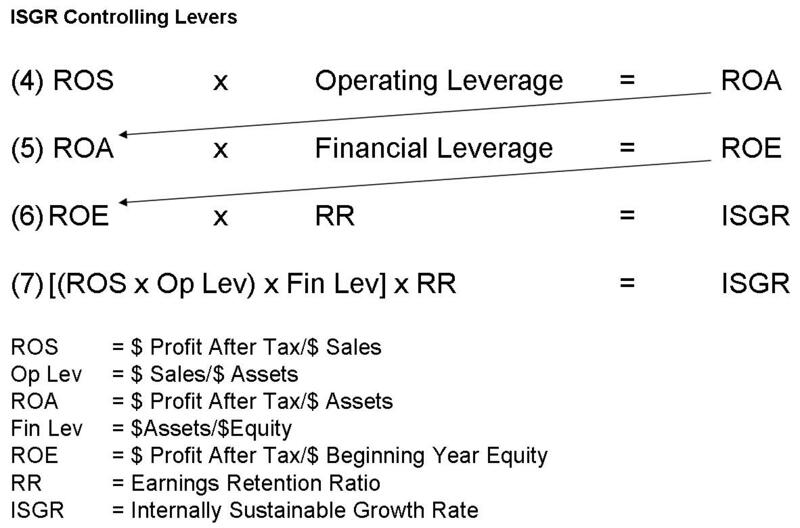 Note that this model is most useful for a company with existing operations and operating cashflow vs. an early stage company still trying to reach cashflow breakeven. The net upshot of the model is that the growth in the total equity base must meet or exceed the growth in sales. 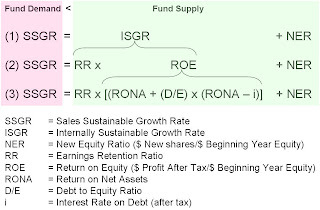 Equation (1) shows that SSGR can be financed from two sources: funds raised from equity (NER) and "internal" funds (earnings and debt). 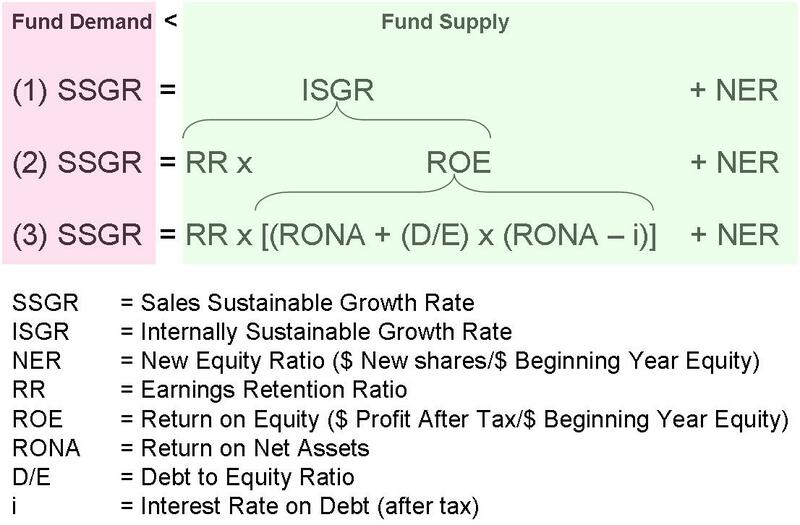 The Internally Sustainable Growth Rate (ISGR) in Equation (2) represents the sustainable growth that the company can get without giving up control to external shareholders. For reasons that will be made clear, growth funds for an early stage startup almost always need to come from a new equity infusion, whether it is "friends and family" or institutional money. But for cash generating businesses, growth can potentially be funded internally. Obviously except for operating leverage, none of this works for early stage startups running a loss without access to debt (and consequently not making dividend payouts), hence the need for new equity issuances. To show you how it works, I've plugged Google's numbers into the model. 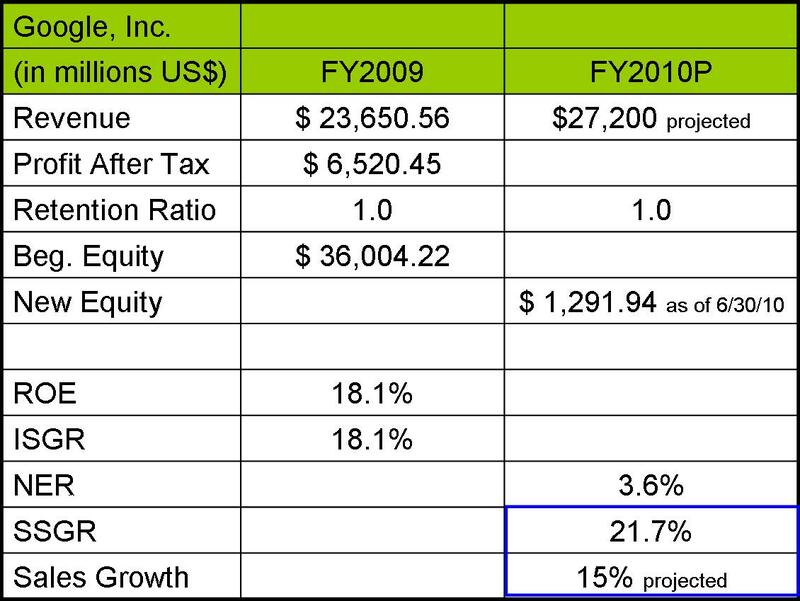 From a financial perspective at least, Google has sufficient resources to fund its projected growth without needing to issue additional stock with perhaps a bit of headroom. Does this indicate that Google could be more aggressive or that some other constraint is holding them back? Maybe. Or maybe Google management is just erring on the conservative side in preserving cash for downside risk management in the still uncertain economy or to retain flexibility in its acquisition strategy. 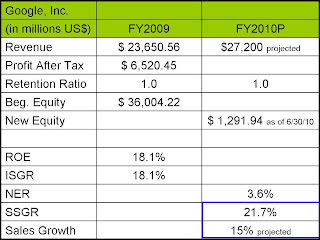 To conclude, the question you should be asked yourself is what is the right growth rate for my company? What are my industry competitive dynamics? Do they require fast growth? Or do we have a decision to make? If controlled growth is an option, what are our barriers to entry? Or what barriers do we need to erect? Is controlled growth desirable? Why or why not? If controlled growth is our objective, how will we limit customer acquisition? If fast growth is our objective, are our business systems, people, and finances adequate to support it? What plan is in place to ensure that we don't allow product/service quality to fall apart? Finally, remember to revisit this question periodically. Your company and your industry will evolve over time.